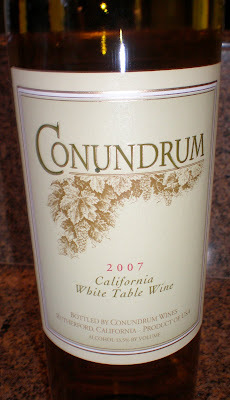 Caymus "Conundrum" 2005 is from Napa Valley and is a terrific blend of three grapes - Viognier, Roussanne and Marsannel. A very floral bouquet is prominent on the palate with hints of honeysuckle and butterscotch. The tropical flavors come through with mango, papaya and kiwi. Fresh fruits flavor such as peaches and pear tease the palate and have a honey & silky finish. Caymus Conundrum has been selected by Wine Spectator as "Wine of the year" in 1989 and 1994.